If you have any questions or want to enquire about dates, use our form to contact Andrew & Kit Hollings or see their website for more information. Beneath watercolour-washed Cumrew Fell, in the quietest corner of Cumbria’s Eden Valley, rests the Hayloft – simple on the outside, light-filled and cosy within (a wood-fired biomass boiler keeps you toasty). There’s a skilful mix of space, comfort, originality and tradition here; pull off your walking boots and pad up wooden stairs to the lovely long-beamed living space. Sofas pull up to the wood-burner; a big dining table accompanies a brilliantly kitted kitchen. There’s even a snug lined with books, with its own view. Down the beamed corridor are two en suite bedrooms: both super-kings with silky cushions, crisp ivory linen and shower rooms with chequerboard floors; a third en suite double room is across the courtyard – lovely and light. The Hayloft adjoins the Georgian house where the owners live but you’re pretty private here, and may use the walled garden; fire up the barbecue on a summer’s evening. Black grouse can be spotted on the local RSPB reserve; the Coast to Coast cycle route starts from the door; fell walks abound. Carlisle is ten miles, the Lakes and the Scottish Borders are not much further. Minimum stay: 3 nights, 7 nights in high season. Pets by arrangement. Short breaks available midweek, from £400. 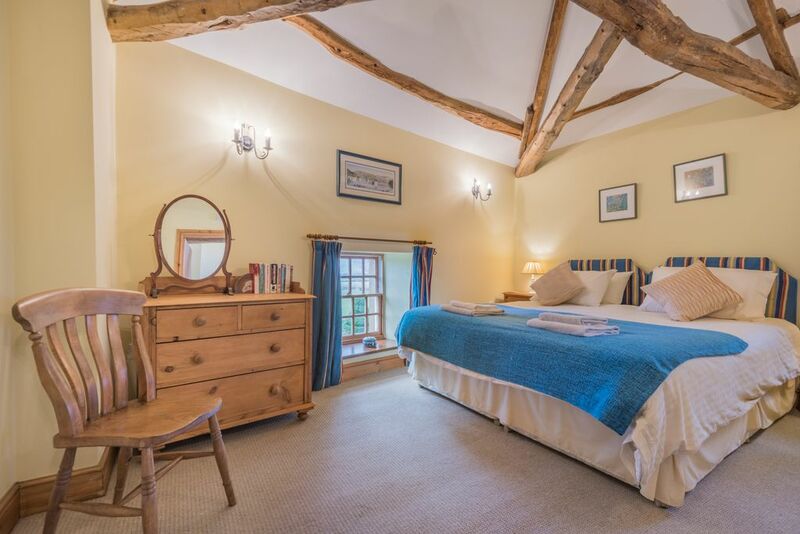 If you relish peace, warmth and comfort at the end and beginning of your day then the Hayloft at Cumrew House is definitely for you! Toasty log burner, comfy furniture, and nothing to see through the windows except lawn and trees. Highly recommended - a lovely place to stay - and it’s jolly clean too. We have just returned from our third visit to The Hayloft within a year ! The Hayloft is a wonderful conversion, so well-appointed, spacious and cosy with the log burner. It is now our preferred Northern getaway - it used to be Perthshire, but we like the change, and the Cumbrian countryside. It is well worth the trip from Bath. We have made use of having Hadrian’s Wall so close for us to explore and also Brampton Golf Course. Great all weather tennis court as well as a beautiful walled garden (with lots of veg !) looking up to the Fell. Kit and Andrew are the most wonderful hosts. The Hayloft, Cumrew House has all the modern facilities you require, but retains a wonderful historical ambience, we loved it. It was clean and very comfortable, and wonderfully quiet at night. The owners made us very welcome and and it was for a week, a home from home. It a great base for a walking holiday, in easy reach of Hadrians Wall, with wonderful hostelries not far away. We stayed at The Hayloft for seven days over the Christmas period with our son and daughter and their partners. We were warmly welcomed by the Hollings to the delightful Hayloft where every comfort had been catered for . In a magical part of Cumbria in the Eden Valley we enjoyed a number of walks in fine weather and even managed a few games of Tennis. We cannot recommend The Hayloft too highly. If you are thinking of booking the Hayloft don't hesitate, it was fabulous. My husband and I stayed in the annex while my son and family stayed in the barn. Great hosts and lots of interesting places to visit. We'll be back. Very enjoyable stay in family group to celebrate a family member’s big birthday. Lovely, comfortable accommodation, good self-catering facilities and cosy log-burner for cooler evenings. The tennis court was a great addition to outdoor activities. Our hosts were very welcoming, friendly and helpful. We wished we had been able to stay longer than we did. We have had a lovely relaxing week here! This was our first visit to the Eden Valley and i am sure will not be our last. The autumn colour has ben spectacular! Thank you. We enjoyed ourselves very much at the Hayloft, thank you. We shall certainly return to make it our base should we decide to revisit the Lake District. It's a very long drive, but worthwhile! We were blessed with some wonderful weather also. A magical week spent with the family at the Hayloft, in stunning surroundings and superb accommodation. Perfect in every way, from fresh eggs in the morning, the most lovable cat Pele, tot he fun and laughter of playing tennis with the family. Fabulous and never to be forgotten. Well equipped, immaculately clean and comfortable accommodation. Hosts very welcoming and full of detailed local information on the area. Lots of beautiful walks along riverside or fell top, plenty of history, excellent local pubs and wildlife. A truly special place to stay. Walk from Howtown on Ullswater, round the lake to Glenridding and take the famous Ullswater steamer back. Stunning lakeside walk with cream teas available en route! Or, for those seeking action on the water, Eden Outdoor Adventures are the folk to help. Hadrians Wall is only a short drive away. Relive history with your family at nearby Birdoswald fort - the kids will love the interactive museum. Alternatively, plan to walk the wall with friends using us as a base. Ask for suggested itinerary. Fancy a tour around a working mill, a river walk with a mysterious cave and a prehistoric stone circle thrown in, Little Salkeld Watermill, 20 minutes away, is the place to go. Bread courses available. Their treacle flapjack is a triumph. Take a drive, or a cycle (not for the faint-hearted!) up Hartside to Alston, the highest market town in Britain. Enjoy a feast of quirky shops, nearby Nenthead Mines for fascinating local industrial history, and a trip on a steam train. Ever watched sheep race round a track, driven a mini Land Rover, dared to descend a 24 foot demon drop slide? Walby Farm Park provides bucket loads of outdoor fun ( and also boasts Cumbria's largest indoor play area). It's a mere 15 minutes drive from us. Tennis courts fully refurbished in Winter 2016, for a match worthy of Wimbledon. Rackets and balls provided if required. Ball-hitting practise available with active, well-coached Hollings family members, if they're at home!